Consider this: In 2014, more than one in three global employers (36%) reported talent shortages. Three in four job seekers consider an employer’s brand before even applying for a job. Only 57% of employers say they use employer branding as a strategy. When talent is as scarce a commodity as customers, employer branding is critical. That’s one reason why 59% of companies are investing more in their employer brand this year. But how does the employer branding and the consumer brand fit together? That’s a question that continues to puzzle CEOs and marketing and HR execs: a survey of 2,000 executives showed that some organizations siloed their consumer and employer branding strategies, others had similar strategies, and others had identical strategies. So what’s the best approach to ensure a coherent brand that’s capable of appealing to two vastly different audiences? Employer and consumer brands should be two halves of a single entity. Together, they answer the question: What does it feel like to create and consume your company’s products and services? It’s a kind of brand ouroboros–the snake that eats itself in a perpetual act of renewal. Without talent, your customers have nothing to consume, and without customers, your employees have no purpose. Bringing your employer and consumer brands into alignment can trigger big gains in both directions. Often, consumers and employees can seem worlds apart. The art of an integrated brand is to find the common ground between them. If you sell skateboards, does everyone on the payroll have to be a pavement-thrashing rebel? No, but perhaps they’re united by a belief that glory comes to those who take big risks. The consumer and employer brand should function as different perspectives on the same experience. Just as a consumer brand can be filtered through different lenses to appeal to unique market segments, an employer brand may also need to be adapted to different audiences. For example, we recently created an employer brand for Ledcor, a diversified North American construction company. While Ledcor already had a parent employer brand in place, they needed to appeal more directly to a very specific subset of potential employees to ramp up a new and fast-growing sales division within the company. 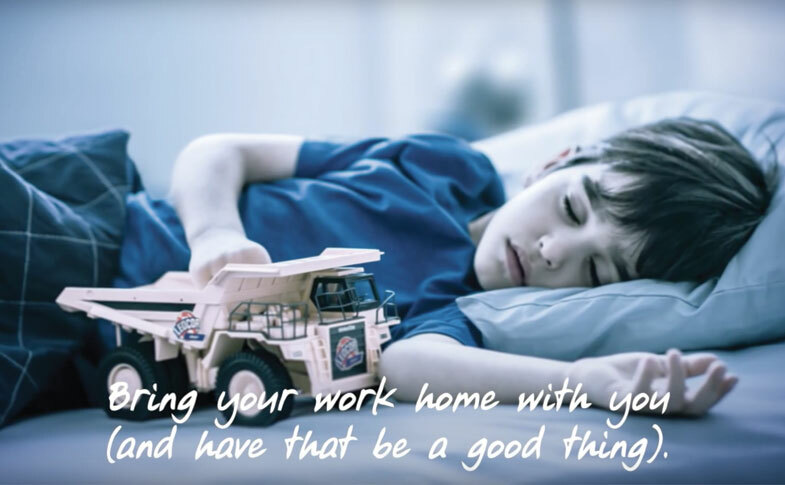 The Ledcor “True Blue” employer brand focused on family values, safety, and mutual support. Like all good employer brands, it provides a complementary perspective on the company’s consumer brand, which prioritizes long-term relationships, accountability, and integrity. But Ledcor needed to reach a just-out-of-school, Millennial demographic, and that required new ideas, visuals, and communication channels that would extend the employer brand in a new direction without undermining its coherence. The “True Blue” core of the employer brand was played out in real pictures and genuine stories of the young people who worked in this part of Ledcor’s business. The “family values,” which appealed to older employees but didn’t resonate for unencumbered Millennials, were reframed as a supportive, committed, and close-knit team dynamic. “Mutual support” was expressed in terms of the commitment and courage Ledcor asked of their young recruits, and the training, mentorship, and on-the-job coaching they received in return. The new expression of the employer brand, which has been parlayed into a new website, interactive engagement tools, and social presence, adds new dimensionality to the core Ledcor employer and consumer brands. Together, they still add up to a unified whole, while allowing Ledcor to flexibly engage with the broad spectrum of consumers and potential workers their business depends on. See the work here.